UPDATED: JUN 3, 2018 Fles 50cl thuis als Thornbridge Bear State. Malten, citrus, hoppig, bitters, fruitzoetje, complex. Uit balans. (2-2017). Smell of hops, some vanilla. Hazy amber colour, creamy white head. Aroma of spruce, hops, grass. Dry palate, soft carbon. Bitter. 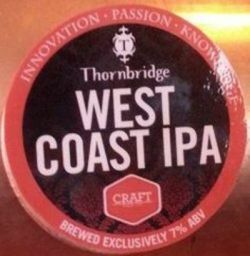 Keg at the rose and Thistle, Frimley, as part of the Thornbridge residency which was supposed to end in January! 5 of their beers on today. Canned fruit aroma, in fact so sweet it reminds me of caramel popcorn or something along those lines. Light gold, some haze to it. Creamy white head soon reduced to a thin film. Medium bitter with a sweet citrus edge. Mango. Syrup. However it still has a hop kick. Medium bodied. On the light side it bolstered by a fizzy carbonation. Long dry finish. Decent enough but could tone down on the fizz. Any sweeter and could be sickly. Draught at Bootleggers Craft Beer Bar, Cph. Slightly hazy golden colour with a thin white head. Fruity aroma with citrus, grasses, toasted notes, pines and an earthy note. Taste is bitter. Medium body with a creamy texture and a soft carbonation. Finishes dry and bitter with grasses and citrus fruits. Nice, old school IPA. Keg cuckfield wanstead as part of tap takeover. Faintly dank smell. Can't describe this as particularly tasty. More cold and pleasant. Generally the thornbridge lighter beers are not as good on keg imo. Still, doing the job. Copenhagen 8/1 2017. 33 cl bottle from Høkeren. What looks like a very green (!) statue on the label. Pours hazy, golden, yellow with moderate white head. Settles as thin layer of foam barely covering the surface of the beer. Very moderate lacing. Aroma has strong hop profile with a strong presence of citrus and more subdued sweet notes. A little exotic fruit - but mostly lemon and grape fruit. Medium carbonation - slightly prickly. Medium thick palate. Flavor is lightly sweet followed by strong bitterness. Aftertaste is sour, bitter and brutal. Finish dry. Yummy IPA which manages to hide the fairly high ABV behind a very strong bitterness. Bottle 33cl. Clear gold with a medium white head. Aroma is apple, spice and caramel. Medium body, soft carbonation. Taste is bitter, nuts, dry fruits and pineapple. 0.33l bottle. Golden color with medium white head. Aroma: pomelo, tangerine, bit perfumy. Taste: tangerine, pomelo, light earthiness and resin. Medium body, lively carbonated, moderate bitterness. Overcarbonation is bit hurting drinkability.